It's taken me a few days to get around to writing this post, because I have no words for the joy I felt seeing my baby girl walking on the screen in front of my very own eyes. I've seen her in pictures, monthly, since last November...but seeing her actually moving gave me a whole new sense of peace. In some of the pictures I've gotten, she's been making silly faces and whatnot, but that's all I've gotten to see. A stillframe of her. I've seen her giant smiles, but up until last Thursday, I hadn't seen them forming across her face. Like I said, I really don't have words. I never thought I'd get to witness some of the very first steps she ever took. She is even more beautiful "in person" than she is in pictures. Her mom told us all about her (how she now has six teeth, hates vegetables, is very independent and persistent, and is a little diva in the making), and we stayed on the call for well over 45 minutes. That was about 35 minutes more than I had anticipated, and I will cherish every second of it. I got to see her do so many things, from finishing her dinner, to walking all around the room and also pulling herself up to self-feeding herself some of those little Gerber "puffs," and even all the way to seeing her press all the keys on the laptop and also knock the camera off it's little stand. Hahaha. She's so rambunctious. I just watched in awe as she walked around, laughing, babbling, and clapping her hands together. She has the sweetest little voice, and I realize how blessed I am to have been able to hear it. I couldn't and still can't believe that exactly one year ago to the day that we were Skyping, she was a teeny baby all swaddled up in her pink and blue hospital blanket. It's unreal. I know a lot of people (birth moms and dads) get the opportunity to have visits; but I truly don't feel that it's right for us at this time. Of course I would give anything to hold her in my arms forever, but I could barely handle hanging up from the Skype call. I don't know that I could handle seeing her. And while so many others do have face-to-face visits, I can't think about that or compare myself, because everyone's story is different. 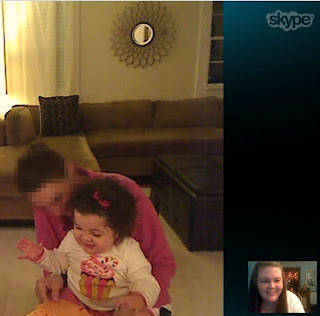 I feel infinitely blessed to have been able to have this Skype video call with them, and even more blessed that it was her mom's suggestion and not my own. I was walking on air for the rest of the night (we started the call right at 6:30 and ended it around 7:20) and the next morning, too. Coincidentally, the next morning was November 4th, which was the day I left the hospital after giving birth to her. The day I left the hospital with so much less than I walked in there with; most importantly, I left without my heart. This year, November 4th was probably one of the hardest days while simultaneously being one of the best days. My heart was broken replaying last year in my head over and over, but at the same time, my heart was swollen with pride and love after seeing my daughter (albeit it, it was on the computer, but she may as well have been right in front of me! ), walking and being so grown up. I suppose I don't have much else more to say...I'm not looking forward to the 'anniversaries' that are coming up in the next few days, but I don't want to dwell on it, and I'm still overjoyed thinking about our call. I don't think I'll ever forget a detail of it. Reading my birthday card...look at that smile! (I pixelated her mom's face, just to protect her privacy. I don't think any of you guys are creep-o's, but you never know who reads these). She is just beautiful. I am so glad you had the chance to have the Skype call with her. I am very happy that it went well. Do you think that you all might do that again sometime? Thank you. I do hope so! Her mom promised to email pictures before the weekend is over and she did say 'see you soon' before we hung up...hopefully I'm not taking it too literally. If nothing else, maybe we can on her next birthday! I'm smiling for you. I'm glad it was even better than you imagined. thats so wonderful, I hope to keep a relationship of some sort with Benjamin's birth parents, so that he can have access to them if he wants it. At this point its just monthly pictures and some phone calls which is great, its wonderful for our precious kids to be loved by so many people. I know hearing (well, reading) how my son interacts with his father helps me to remember just why I decided to place him, he too wouldn't have been a father's boy if I had kept him, his father still doesn't think he's the dad, so I think, for you, it's the same, a sense of relief in knowing that your decision wasn't in vain, and that your daughter will know so much more love than we could have ever hoped for them. I too don't know how I'd handle a face to face interaction, I know how hard it was getting over saying Goodbye the first time, I'd think it'd be the same thing all over again. But I'm so glad you were able to Skype with them, and see her in action. I wish I knew what my sweet son sounded like. For now though, I have it in my dreams what I think he sounds like. Hi there, new reader and adoptive Mom here. I really adore your blog. This is so very sweet! I'm so glad that you had this opportunity. Your little girl is just gorgeous and obviously so happy! My thoughts are with you for the next few days. I'm glad you got the chance to have that Skype call and to see all those little milestones that we as birthmoms often miss! I'm not trying to change your mind on asking for actual visits, but for me....NOTHING, absolutely nothing, compares to actually seeing my daughter in person and getting to interact with her. I won't say goodbyes are easy - they never are. But I wouldn't trade getting to hug, love & kiss on her for the world. Just something to think about. Hang in there. I know bdays and surrounding days are hard. My daughter will be 2 this Thursday, and I've got a persistent knot in my tummy already. And Monika, part of me does wish I had in person visits...but it's not entirely up to me, though. Her parents have said they would be more comfortable waiting til she's "older," but haven't specified an age and have promised to keep the conversation open and have it be a topic we can always circle back to if either of us wants to discuss the possibility again. I can't imagine how amazing it must be and also how hard it must be to say 'see you later' again. Happy Birthday to your little girl! You'll be in my thoughts.